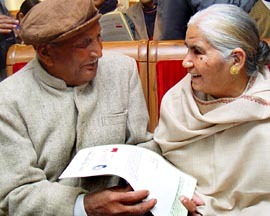 Mr Harjinder Singh Khurana, a retired Chief Engineer of Punjab State Electricity Board, and his wife Satwant Kaur were today arrested by the district police for allegedly killing their daughter-in-law Harneet Kaur (24) for more dowry. Can the state government afford the derecognition of the oldest medical college of Punjab to save recognition of another college? This is true in case of Government Medical College Amritsar which was established in 1928. 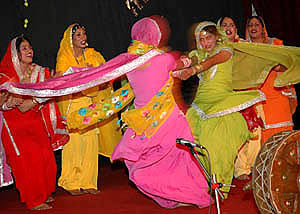 The split in the Damdami Taksal is a significant event in Sikh history. Damdami Taksal traces its origin to the 18th century. Baba Deep Singh, a well known martyr in Sikh history, was the founder of the Taksal. 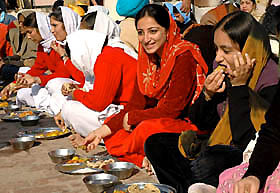 The Taksal functionaries have been roaming preachers and exponents of Guru Granth Sahib. The Punjab Mandi Board, has allegedly failed to initiate any disciplinary action against a District Mandi Officer, despite being directed by the office of the Punjab Chief Minister, Capt Amarinder Singh to do so. The said DMO has been ‘indicted’ in probes, conducted separately by the Punjab Mandi Board authorities and the Director, Colonisation, Punjab. Concerted media campaigns and directions of the apex court as well as the Punjab and Haryana High Court notwithstanding, national and state highways in Punjab continue to be dotted with liquor vends and ahatas. The Punjab Government has submitted a project worth Rs 150 crore to the Union Government to set up a national institute of biotechnology in the state. A few months ago, the Prime Minister, Dr Manmohan Singh, had promised to fund the setting up of such a project. The stage has been set for private generation of power in Punjab with the PSEB going into an agreement with an American firm whereby the board will buy back power generated by the firm at its proposed 150 MW thermal plant in Bathinda. The district police has arrested head constable Gurdial Singh, working in the security branch of the SSP’s office, for allegedly recommending the papers of Prem Pal Singh, member of the Babbar Khalsa International, for making a passport without any police verification by taking bribe. The Shiromani Akali Dal (Longowal) will be starting a Mukti Andolan on the Maghi Mela to be held in Muktsar on January 13. The Punjab Pradesh Congress Committee chief, Mr H.S. Hanspal, has convened a meeting of secretaries and organising secretaries of the PPCC on January 6 at 11 am to discuss plans for mobilising support for tsunami victims, Mr Rajpal Singh, spokesman of the PPCC announced yesterday. Anxious hands trembled with excitement as members of economically weaker sections of society were handed over allotment letters of 370 dwelling units in Jalandhar's 'Rajiv Gandhi Vihar' by Punjab Chief Minister Capt Amarinder Singh. The district administration has decided to celebrate in a big way the four-day Maghi Mela in connection with the tercentenary of the martyrdom of 40 “Muktas” who fought the Mughals. A delegation of 26 MLAs of Punjab will visit Pakistan for a week from January 15. Dr Kewal Krishan, Speaker of the Punjab Assembly, will lead the delegation. As many as 9 Akali MLAs and two independent MLAs will also be part of the delegation. Remaining MLAs will be from the ruling Congress. As many as 262 Indian fishermen who were released from different jails in Pakistan on January 2, will be repatriated from the Wagah joint check-post tomorrow. The Education Department has given a clean chit to Mr Kulwant Singh Bhatti, posted as Center Head Teacher at Gobindgarh village near here. Mr Bhatti had been accused of allegedly torturing a Dalit student at Government Elementary School in the village in August last year. Interestingly Mr Bhatti himself heads an organisation that had been fighting for the rights of the persons belonging to the Scheduled Castes, Scheduled Tribes, Backward Classes and Minorities. The ashes of Sri Singh Sahib Bhai Sahib, Harbhajan Singh Yogi, will be immersed at Kiratpur Sahib on January 11. It was a happy reunion for 12-year-old Gaggandeep Singh, who was kidnapped from Lohara village of Muktsar district, when just a toddler, and finally met his mother after nine long years. Gaggandeep, who was found in custody of Dar Vijay Pandey, hailing from Uttar Pradesh and living in Bathinda, was working in a ‘dhaba’ (kiosk’) and was rescued by the police after he was admitted to a hospital following an accident. 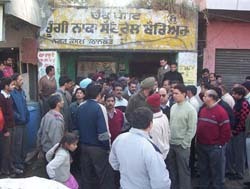 A large number of Punjabi folk singers, led by the renowned Sardul Sikandar, under the banner of “Lok Gayak Kala Manch Punjab” presented a memorandum to the Deputy Commissioner demanding a ban on the playing of DJ systems by the so-called artists and sound-system owners at public places in the district. The Shiromani Gurdwara Prabandhak committee (SGPC) sent a 24-member medical team and medicines worth Rs 1 crore for victims of tsunami-affected areas of Tamil Nadu here today. Traders here today gheraoed an octroi post located near the local SDM office in protest against the alleged highhandedness of octroi contractors. The tiff between the traders and the octroi contractors started after the contractors allegedly downloaded the entire material of a trader for its physical verification. Seven persons, including two women and a child, sustained injuries, when four vehicles, including two cars, one tanker and a scooter, collided with each other near Cheherru on Shershah Suri Marg early today, the police said. Farmers of six border villages in the Fazilka sector staged a protest dharna at Canal Rest House here today to protest against the non-payment of compensation for the land mines laid in their fields two years back. Following the state government’s orders to initiate action against its employees involved in deletion of names of genuine voters during the last Assembly elections, the local municipal council has recommended disciplinary action against them to the Local Bodies Department. Mr Lal Singh, a PSEB cashier of Badrukhan subdivision was suspended while similar action has been recommended against a revenue accountant, Mr Kuldip Kumar, of the same subdivision after an amount of Rs 5600 was found missing from the chest. The Punjab Government yesterday ordered the transfer and posting of three PPS officers. An order issued by the Department of Home Affairs and Justice claimed that the transfers had been ordered “on administrative grounds”. The Municipal Corporation today demolished three showrooms one month after the start of construction work in the Bank Colony area. The Deputy Commissioner, Mr Mandeep Singh, has fixed the rates of bricks and tiles for government and semi-government works in the district. A panch of Moom village, about 20 km from here, has reported that she was raped on January 3. 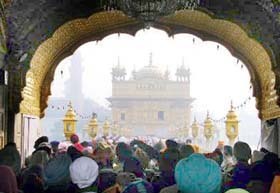 In her complaint, she stated that when she was going to see her sister-in-law around 6.30 p.m. on January 3, Raminder Singh, alias Rama, and Gurcharan Singh called her to their house on the pretext of sorting out a land dispute. She added that she accompanied them to their house, where they raped her. A fraud has been detected by the Deputy Commissioner in the records of medicines being supplied to patients at the Civil Hospital, Bassi Pathana. Paramjit Kaur and Rajwinder Kaur of Maqboolpura area were arrested by the police for allegedly kidnapping her newborn baby. Notwithstanding the rationalisation exercise of the Education Department, Punjab, about 80 per cent of government high and senior secondary schools in this subdivision, are being run without principals and headmaster.